Once upon a time, when men were men and dragons were dragons and anyone who was male had beards and an attitude, the most incredible, graceful, sleek ships sailed the seas. Designed to carry up to 100 fearsome warriors, they were clinker-built: constructed with overlapping oak planks which could be a thin as an inch but compact and watertight. Flat-bottomed, proud-prowed, riveted together with wrought-iron rivets and roves, even their oars were seated differently in the ship to their forebears. not secured by row locks – external brackets to secure oars – but rather with oar ports, so rowers could row when it suited them and withdraw when the wind was high to streamline the vessel. In favourable conditions the ships were known to reach 15 knots. It is ironic, then, that the latest Viking ship to cross the seas did so as a flat pack. It had to: only 20 per cent of the timber of the Roskilde 6 longboat, excavated from the banks of Roskilde fjord in Denmark in 1997, survives. It is customarily displayed these days on a steel frame. It has been on display at the National Museum of Denmark, but the ship, thought to date from 1025, is on the move once more. Within the last 48 hours, the British Museum announced that the ship arrived safely. Now it will take two weeks to put it all painstakingly together. It will be the centrepiece of an extraordinary exhibition, Vikings: Life and Legend, which opens in March 2014. The ship will be surrounded by artefacts from the British Museum itself including the breathtaking Vale of York treasure hoard; and intriguingly, we will see relatively new finds: skeletons from a mass grave of executed and beheaded Vikings near Weymouth in Dorset. Oh, the stories those exhibition halls will tell. Vikings: Life and Legend will run from March 6 – June 22 at The British Museum. For booking, click here. Posted in In the news, Quirks of HistoryTagged British Museum, dragon boats, exhibition, Viking, Vikings, Vikings: Life and LegendBookmark the permalink. Yippee! Thanks for letting me know Kate – ODIIIIIIINNN! Tony Curtis Brooklyn Viking! That was a fun film, wasn’t it! Tony’s accent when he goes all mystical about “dat is where de nawth wind blowsss” is one of my favourite cinema moments. Also his severed arm being about a foot longer than his good one! They don’t make them like that anymore! Ah yes. Eminently drawlingliy memorable. One should hope not! Still, it had a catchy theme tune (remember it played on the Alpine horn in the Norwegian fjord? ), a great villain and an exciting siege of an anachronistic Norman stone castle. And the wolfpit….don’t forget the wolfpit! Yay. Last one to the BM is a rotten egg, Jim. Great and evocative reminder about this BM show — hope to get to see it sometime. Sure it’ll be busier than the last one I saw about Peruvian gold, the fabulous legend of Eldorado. Anyway, like the flatpack motif! 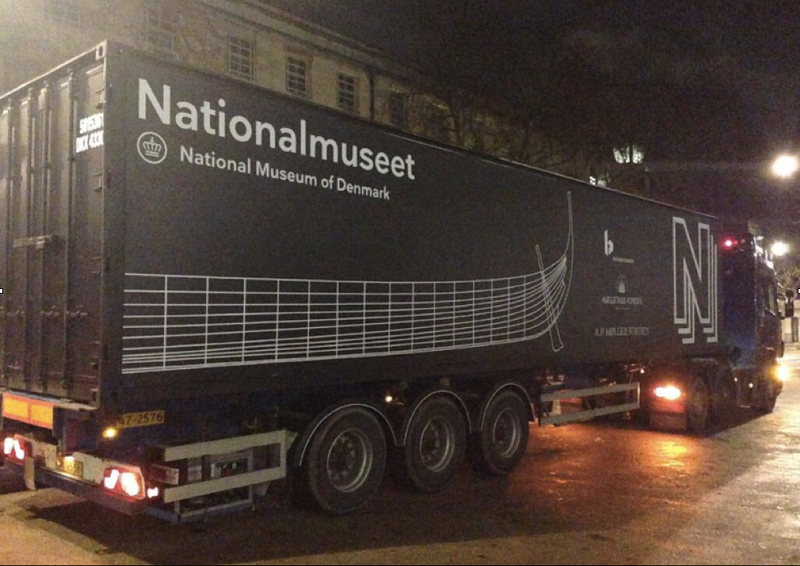 who would have ever thought that a viking ship might arrive in England by land. The Vikings would be turning in their longboat watery graves. I wouldn’t have thought the English would be so keen on celbrating Hagar the Horrible and Co. – they were not exactly welcome visitors! I imagine it is only on loan and will cruise back to Denmark in due course? They were more welcome than you think, Col- and had a huge impact on the peoples who came afterwards. As the exhibition os due to show. It’s redressing the balance – showing how sophisticated this culture really was. They still nailed Vikings to church doors in Essex, though. I hadn’t thought of them as being sophisticated, although their longboats are certainly impressive examples of craftsman-ship! Charming little Christian custom in Essex, that. NO. I don’t think a ferry has quite the same romance, Nancy. A Viking ship reduced to a piece of Ikea furniture. The exhibition should be fascinating. Well I am glad the Vikings got their due at Weymouth and got a taste of the ax. They are not quite the baddies they are made out to be in our history books, according to the British Museum, Carl. I wonder what led to the grave near Weymouth? This is absolute torture, Kate. There is absolutely no way I’ll be able to come over there during that time period. Yet, I’m still scheming. I’ve stood on the banks of the fjord at Roskilde. I *think* the ship was there when I was, but I can’t remember. MTM only wanted to look at Roskilde Cathedral, which is a place that would interest you for days, I suspect. Andra, should you make it over, there’s always a bed at ours 🙂 I’d love to see it with you. Those lands which bore the men who made these stunning sea craft: they are wildly beautiful, as are their stories. I’d love to see them all some day. Oooh, Tandy, you’re over in May? Fantastic!!! It’s worth getting tickets ahead of time. I have a feeling this exhibition is going to be extremely popular. They do. And it seems this latest one has travelled as well as the rest; now to see the results! What a wonderful exhibit. I’ve watched every episode of The Vikings on the History Channel just hoping to absorb the almost mythic proportion of Viking history. This would be an exciting exhibit. I wish it were possible for me to enjoy it. I’ll rely on you for a good report! Would LOVE to see this exhibition, even if only vicariouslyI know you won’t let us down, Kate. 🙂 Now to get some tickets, BB! I’m so jealous!! I’ve loved Vikings ever since — I hate to admit it — I first saw “The Vikings” as a teenager. Thank you so much for posting that trailer. The first three notes of the theme refrain had me instantly humming along. Pleasure. It was a classic of its time. I’ve always loved The Vikings, the movie that is. Especially the siege of the castle at the end. Remember when the Vikings needed to lower the drawbridge and all the men threw battle axes at the closed wooden bridge? Then Kirk Douglas took a running leap and climbed up, using the battle axes for handholds so he could cut the ropes or whatever that held the drawbridge closed. Very thrilling. He also played a good Doc Holliday in Gunfight at the OK Corral. I’d love to see the exhibit.